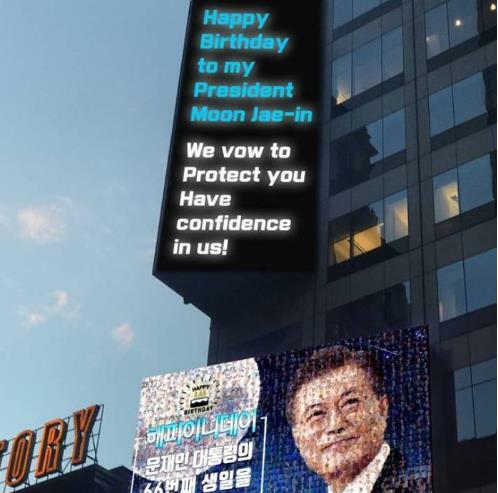 With South Korean president Moon Jae-in’s birthday only a couple of days left, supporters of the president celebrated his birthday with the luxurious Times Square ad. On January 22 in the morning, an ad celebrating President Moon’s 66th birthday made its appearance for 2.5 minutes. 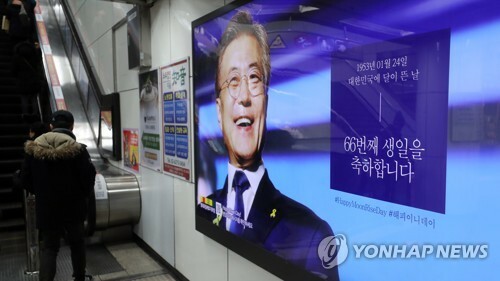 The ad displayed messages reading: “Happy Birthday to my President Moon Jae-in. We vow to protect you. Have Confidence in us!” A video showing his achievements and the 2012 presidential campaign was also played along with the birthday wish. In Korea, the ad will be played in Korea twice for five minutes on the day of President Moon’s birthday, which is January 24. Previously, the Moon supporters have put up ads in subway stations in Seoul. It has recently been a rising culture among K-pop fans to fundraise money and place celebration messages as subway ads.